Visit Neighborhoods on the County website to learn about other projects in your area. This week the County’s contractor installed barriers and signage for the project’s maintenance of traffic plan. As a result, the sidewalk under Clark Street on the north side of 15th Street is now closed. The sidewalk on the south side of the street remains open. Also, a portion of the sidewalk on the west side of South Bell Street is closed between 15th and 18th Streets. Crews are installing erosion and sediment controls and safety fences along the project site. They have also started selective demolition of items along the bridge structure, such as guiderails and posts. This photo shows a realigned Long Bridge Drive, looking toward the Boundary Channel Drive/I-395 interchange. 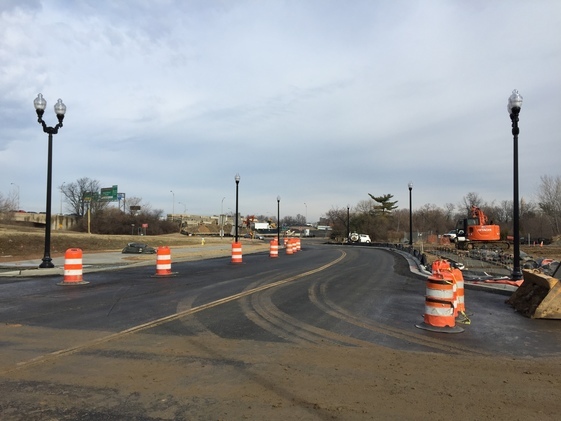 A County project is underway to extend the reconstructed section of Long Bridge Drive to the Boundary Channel Drive/I-395 interchange, and to realign the road in order to tie it into a future interchange. For project details and additional construction photos, visit the project page.